You might not want to come out! Bedroom closet organizers can help transform your bedroom closet from a hard-hat area to a relaxing part of your bedroom. Instead of stuffing everything imaginable into your closet and hoping you can close the door, everything has its place and you can easily find what you need once the closet is neat and organized. Many people complain about having a closet that's too small when in fact it is just not well organized. You would be surprised at how much can fit into your closet when you implement a bedroom closet organizer! When you use an organizer for your closet, it may suddenly seem like you have more space but really, the space is just used more efficiently, which is a big benefit all on its own. Another benefit is the time you will save. When you know exactly where to find what you are looking for, you won't find yourself lost in the bottom of your closet for an hour looking for that other shoe. As long as you know that everything has its place, the things you need will be easy to find within seconds. You may also find that you save money with a closet organizer. When your closet is organized, it is easy to see exactly what you have. That means you may not have to run out to get the right blouse for that pair of pants; you can easily see that you have the perfect piece right in your closet. Your clothes will also be neat, clean and wrinkle free in a properly organized closet. You won't need to iron before you can put on that skirt because it is hanging, neat and tidy and ready to wear. There will be fewer trips to the dry cleaner due to clothes being trampled in the bottom of the closet. When clothes are put away properly they last longer as well. Organized clothes are less likely to get damaged and need replacement. No matter what your budget, you can find a closet organizer system that will fit your needs. Bedroom closet organizers can be simple and inexpensive. Go to any mass merchandise store, such as Target or Walmart, and you'll find a nice selection of modular pieces. These pieces are affordable and allow you to select just the pieces you need for your closet. Organizer products can vary from heavy duty wire shelves and baskets that give your closet a clean, simple look to rich, wood pieces that reflect elegance and style. Pieces can range from $20 to $1000 or more depending on the style and the individual piece you choose. Here are some DIY systems for you to choose from. 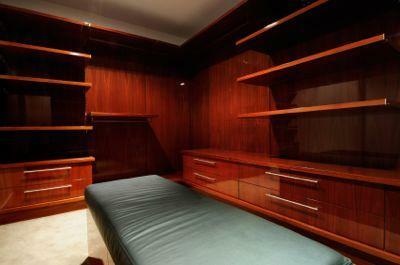 The sky is the limit when designing a bedroom closet organizer. You will be amazed at the luxury available for your closet. Prices will vary considerable depending on the type of organizer you want, the size of your closet and of course, the company who does the work. You can expect these custom closets to be considerable more than the modular pieces you can purchase off the shelf, but you are also paying for labor. You can also check out your phone book and look for organizing services in your own town. There are likely many independent small businesses that can create the closet of your dreams at a price that fits your budget. Whether you choose a DIY system or hire someone to build the perfect system for your bedroom closet, one thing is certain. You'll wonder why you didn't do it a long time ago.